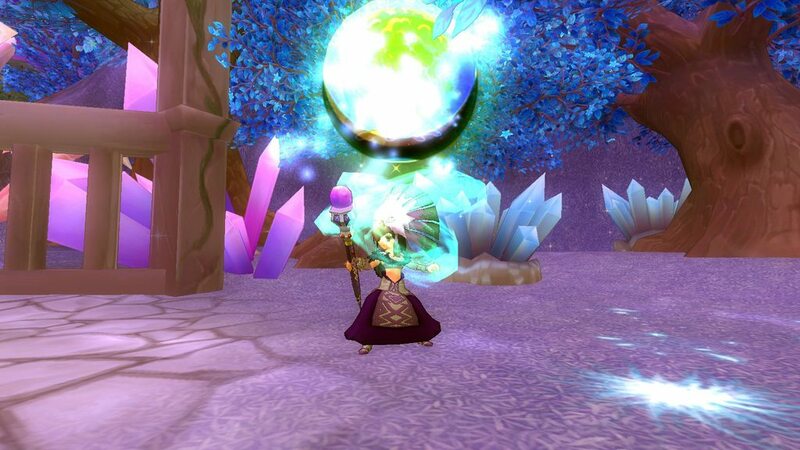 Healing & Support classes in Eden Eternal wield powerful healing and boosting magic. Reach character level 5 and you'll unlock the Cleric, your first Healing class. The Healing/Support branch doesn't stop at repairing wounds, the Cleric, Bard and Shaman all excel at casting stat boosting spells, summoning natural creatures, even bringing other players back to life. The Cleric casts a variety of healing and booster spells from a powerful law book. You won't find a more generous and compassionate class than the Cleric. Once tasked with the salvation of all the citizens of the land, the Cleric continues to watch over and protect those near him within the region's current tumultuous climate. Use the Cleric to heal party members and amplify stats and spells during battle. Sanction's LightIncreases M-ATK. Deals Holy damage to a target, reducing its Holy and Nature Resistance. Holy SmiteIncreases M-ATK. Deals Holy damage on the target area of 20 feet. Also has a 50% chance to stun all targets over 3 sec. Light BlessingIncreases a target's LCK. Also Increases Holy and Nature Resistance by 10 points. Lasts 15 min. Grace of WisdomIncreases a target's INT and WIS. Lasts 15 min. Life CureHeals a target at least a certain number of HP per sec for 12 sec, stacking up to 5 times. Hard TruthIncreases a target's Max HP and Max MP by a certain percentage. Also grants extra points to its Max HP and Max MP. Lasts 15 min. Purifying WindRandomly removes 1 debuff from each party member within the target area of 25 feet. Also Increases healing effect by 10% over 12 sec. Healing RadianceHeals each party member within the target area of 25 feet. Hammer of DisciplineDeals Holy DMG per second and reduces EVA. Stacks up to 3 times. Not affected by M-ATK. Divine LightInstantly heals a target. Affected by G-Healing. "Kiss it and make it better? I'm more a tough-love sort of Cleric. Brace yourself!" You are most likely to find a Bard relaxing in the shade of tall oak tree, quietly composing poems and songs. 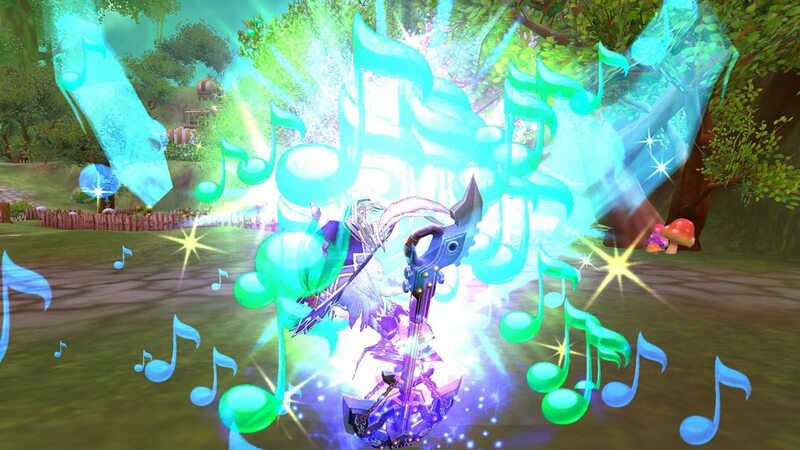 Often Bards are also found at the center of boisterous social events, wooing the crowd with charming music and dance. 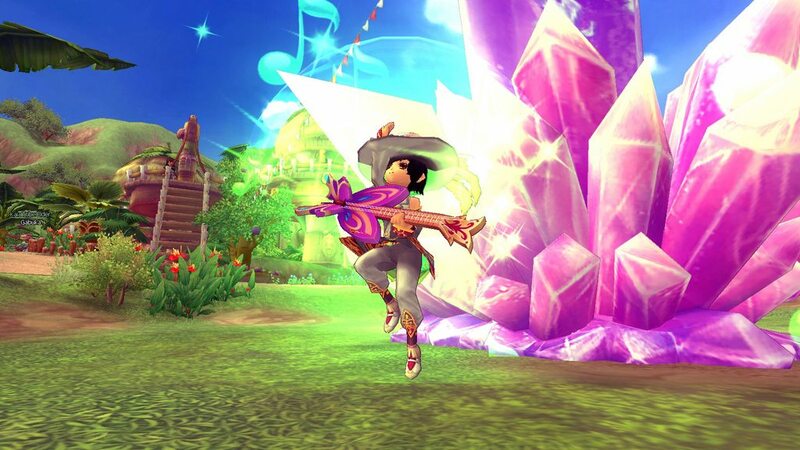 Little known the to the people is the colorful Bard's excellent combat prowess. 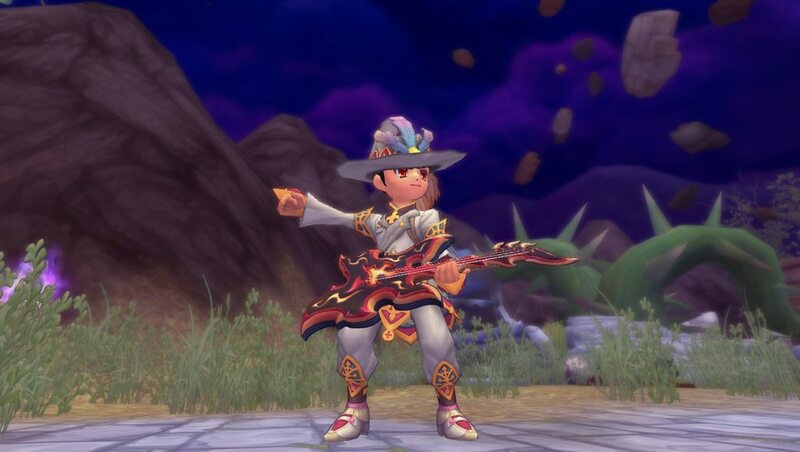 Using arcane musical spells and enchantments, the Bard suavely overwhelms the enemy with waves of power chords and fast-paced hypnotic music. The Bard's gregarious songs and sonnets also have healing and defense powers. Vocal BombIncreases M-ATK. Deals Fire damage to a target. Has a chance to knock down a target if Earth Shock is on the target. Burning MetalInflicts Fire damage per sec on the target area. Also reduces all enemies' DEF, stacking up to 3 times. Music of LifeHeals each party member within the target area, stacking up to 3 times. Demonic SymphonyIncreases the Magic damage dealt by each party member around you. Spirited MelodyIncreases the CRIT Rate and M-CRIT Rate of each party member. War RhymeIncreases the Physical damage of each party member around you. Songs of IllusionIncreases the EVA and DEF of each party member around you. Poem of WindBoosts a target's Move SPD. Holy ConcertoIncreases G-Healing and P-Healing for caster and party member within 40 feet for 12 seconds. Musical EncouragementReduces damage taken and gives caster and all allies within 40 feet immunity to Sleep for 8 seconds. "No! You can't read it until it's done! I have to find something that rhymes with orange..."
The Shaman is the most heavy-handed class of the Healing and Support branch. Mystical shamans expertly manipulate the elements of nature to rain torrents of damage upon the enemy. 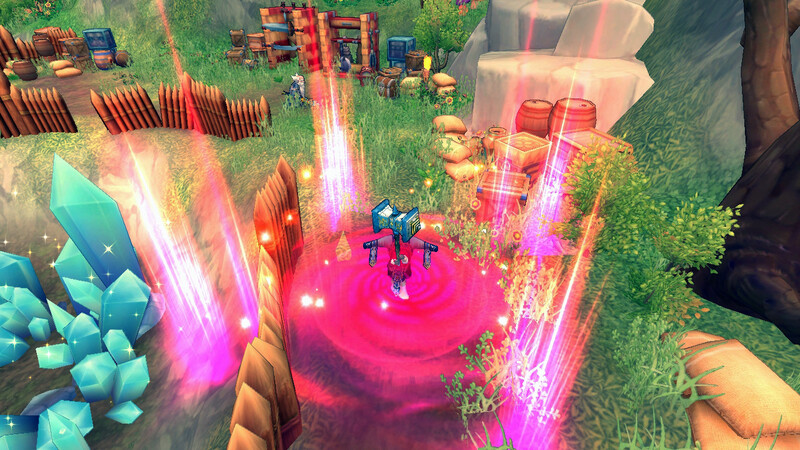 Disorient your enemies in a whirlwind of earth, nature and fire spells. Natural PunishmentIncreases M-ATK. Deals Nature damage to a target, having a chance to immobilize the target. Rage of LightningInflicts Lightning damage per sec to a target. Also reduce its ASPD and Cast SPD, stacking up to 3 times. Thorn ShieldIncreases a target's DEF for 30 sec. Also reflects Physical Damage taken back to the attacker. Marks of WindIncreases a target's AGI and LCK. Earth EnergyIncreases a target's STR and INT. Drops of HeavenHeals each party member within the target area. Also has a chance to grant additional HP. Totem of WrathInstantly summons a Totem of Wrath to assist you, casting Flame Wave and having a chance to stun the enemies. The Totem's level equals your skill level. Totem of GraceInstantly summons a Totem of Grace to assist you, healing your nearby party members, and having a chance to randomly remove 1 debuff from target. The Totem's level equals to your skill level. Black Puma Transform into a Black Puma for 12 seconds. Increases Move SPD +20% and EVA. CallbackRevives target. EXP penalty will be decreased by 50%. Can be cast in combat. "It's not nice to fool someone who can incinerate your heart." Completion of the Quest: "Test of the Sage"
Wielding large hammers, Sages are the holy apostles who control various aspects of the holy light. 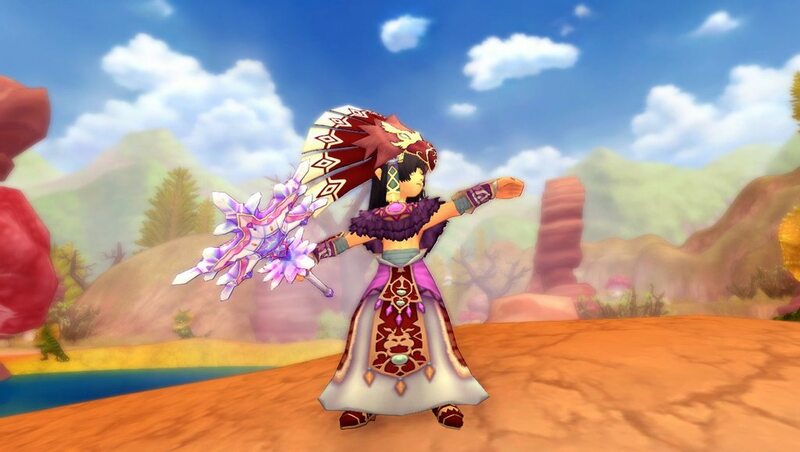 Not only able to use their magic for healing, Sages are able to survive on the forefronts of the battlefield with their various skills to support their allies and weaken the enemies. 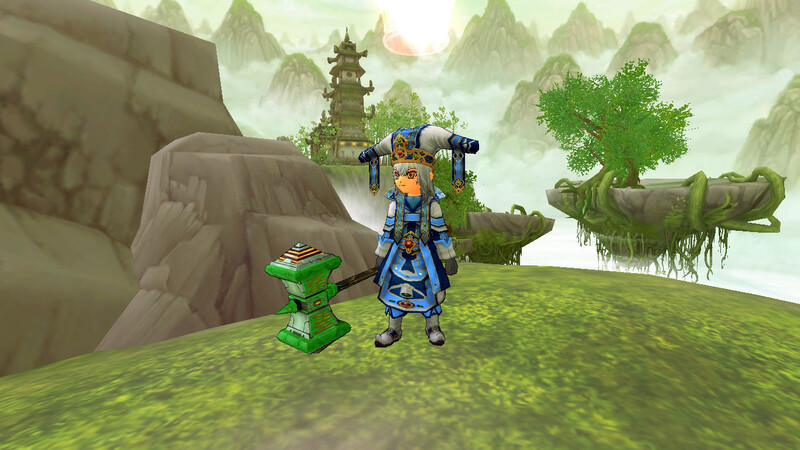 While Sages are exceptional healers, Sages are also well known to be supportive warriors who are the key to victory. 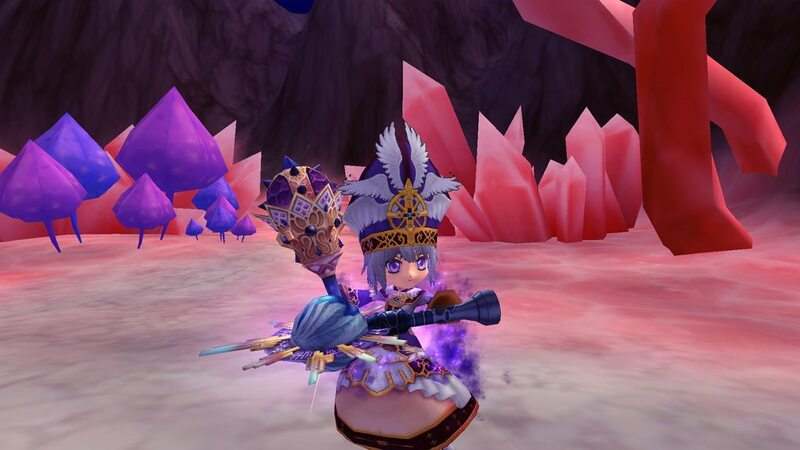 With their knowledge of various holy skills, Sages help their teammates overcome difficulty by difficulty. Hammer of HealingAttacks the target. Heals party members’ HP within 15 meters. Hammer of InspirationAttacks the target. Recovers party members’ MP within 15 meters. Aura: Hammer FriendInstantly recovers own HP. Immune to knockdown and increases P-ATK of party members within 15 meters for 20 seconds. Cannot be used with other auras. 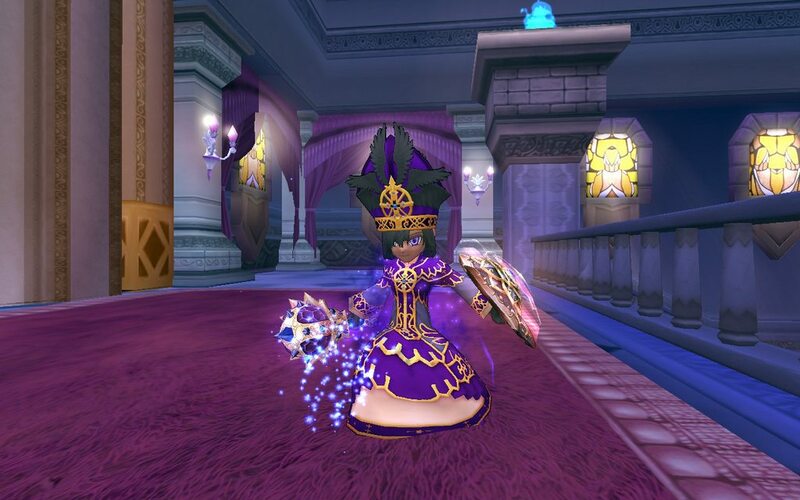 Aura: Raise SpiritsInstantly recovers own MP. Immune to fear and increases M-ATK of party members within 15 meters for 20 seconds. Cannot be used with other auras. Aura: Protective ShieldIncreases Parry. Immune to immobilization and increases DEF and decrease damage taken of party members within 15 meters for 20 seconds. Cannot be used with other auras. 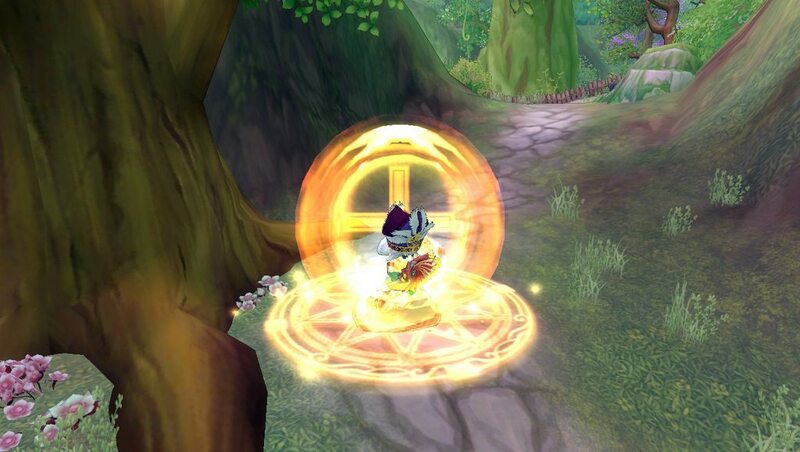 Aura: InvisibilityMakes invisible and increase Move SPD and EVA of party members within 15 meters for 15 seconds. If attacked while invisible, 4 times the damage is taken. Cannot be used with other auras. 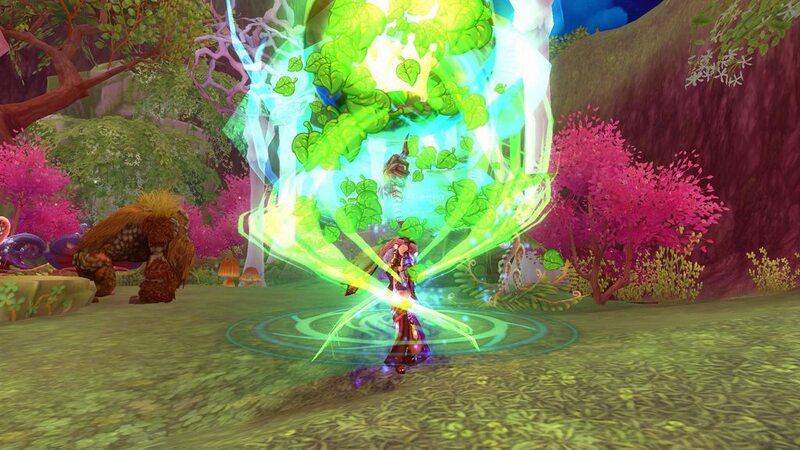 Aura: SingularityDecrease HP and MP every second and decrease Move SPD 30% of targets within 15 meters for 20 seconds. 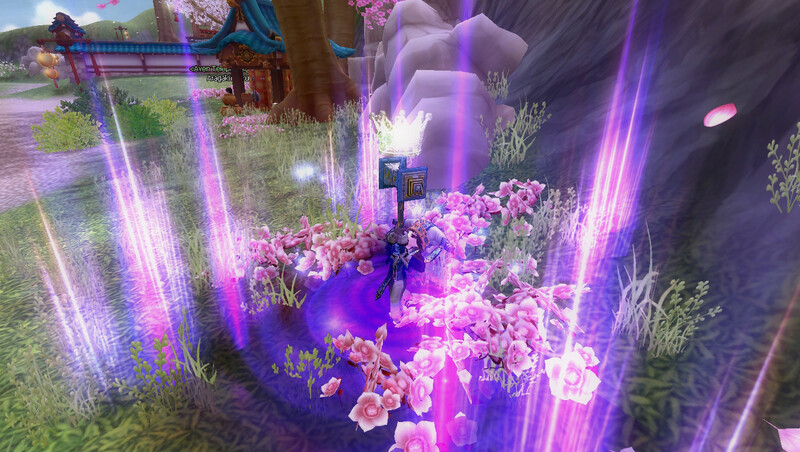 Cannot be used with other auras. True GritRemoves debuffs of party members within 15 meters. Increases HP and MP for 30 seconds. Holy BlowAttacks targets within 15 meters with Holy damage and inflicts knockback. Does not effect bosses. "A Sage will prove your most trustworthy ally on the battlefield. Sages can rescue teammates from certain death at critical moments."